This striped fish is native to Sumatra and Borneo. They are normally found in clear streams but they will move into flooded plains and black water rivers during the Monsoon season. You should provide a lot of hiding spots for this little guy. He like to hide with friends, so the spots should be large enough for several Clowns to fit. Keep these fish with four or five of other Loaches. Provide a good current in the tank and excellent water quality. Lighting should be subdued to more closely match their habitat in the wild. This is a peaceful fish that prefers to be kept in groups. It can become very active and should not be kept with shy, skittish fish. Very tiny fish will become lunch for these scavengers. They do very well with Tiger Barbs because both species like to school with similar colored fish. The females will be a little fatter than the males. Adult males have a strange shape to their tail fins. The upper and lower tips will be bent inward toward the center, making their tail fin have a claw shape when viewed from the side. Clown Loaches can be funny fish. They will play dead in the absence of a good hiding spot. Always check for gill movement and let them stay in the aquarium for a couple hours before you remove them as a casualty. They will use their pectoral fins to sift through the substrate for food. The manner in which they do this makes them appear to be walking around the bottom of your aquarium. If you have a school of Tetras, they will entice shy Clowns to be out and about during the daytime. Sometimes, when feeding on a food that they really like, these funny little fish will make happy clicking noises. Take care with juveniles to have the inflow and outflow of filtration and powerheads grilled over. Young fish of this species like to cram themselves into ridiculously tight spaces, and your filtration seems like a great hiding spot to them. I have heard stories of these little tunnel rats being found dead after having wormed themselves all the way to the cannister area of a filtration system. 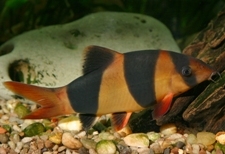 Clown Loaches are not bred easily in captivity. They are rarely, if ever, seen spawning in the home aquarium. Many of these fish are captured as juveniles in the wild and sold to aquarists. Some may be bred in facilities that use horomone treatment to induce spawning. This is most likely because they are seasonal migratory spawners. For more information, go to Wikipedia's Clown Loach page.